Guys. This couple is so near and dear to my heart. I worked with them last year, doing month-of coordination for both their holud and wedding in May of 2017. They reached out to me a YEAR in advance and I immediately booked them even though I normally don't book that far out. That's because their email mentioned their non traditional backgrounds (he's half Italian catholic/half Jewish, and Nasheed's parents are from Bangladesh and Muslim) in addition to references to Aladdin, The Book of Mormon, lip sync battles, and other insanely wonderful non traditional ideas! So this obviously has to be a two-part-er. Come back on Thursday for their ridiculous wedding. But now, onto the holud. 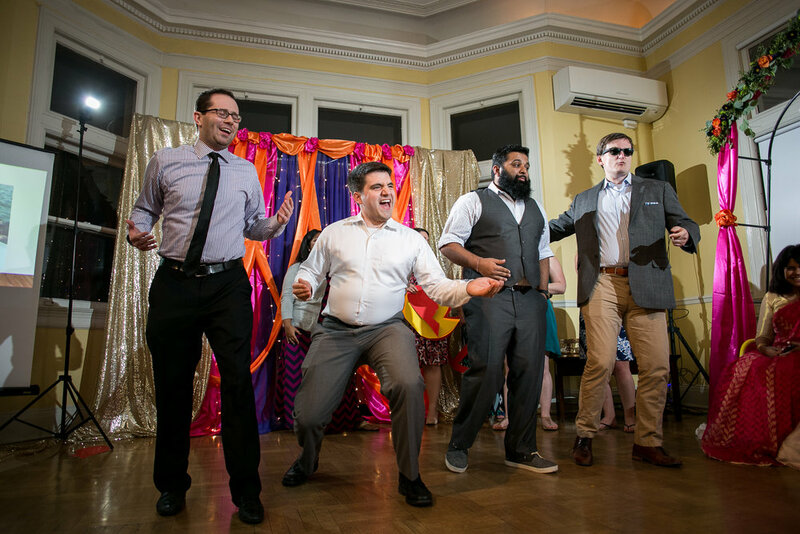 In addition to the holud being co-ed, their email mentioned that it "may or may not include a lip sync battle, roast of the bride/groom, airing of grievances, feats of strength, and/or white people awkwardly trying to do synchronized dances to Bollywood music in lieu of whatever is actually supposed to happen at those things." YES. It was all of those things, and so much more. Josephine Butler Parks Center was the venue and it was a huge DIY affair. Big thanks to Nasheed's fantastic friends who created her "stage" decor, as well as to my lovely associate Tarra who assisted the hell out of it (including putting out a small fire with her bare hands. That girl is fierce). While there were some traditional elements, such as the henna and delicious food, there were also amazing untraditional moments - like all the performances, including a Circle of Life recreation with a very unwilling Simba, lip sync battles (my all time favorite activity), and much, much more. Enjoy this colorful, hilarious evening captured by Ayesha Ahmad Photography!